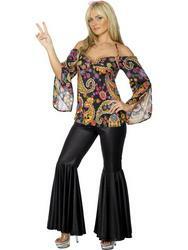 Revive the famous look of the Summer of love with this totally groovy swinging 60s fancy dress costume. The cool costume contains everything for turning you into the sassiest 60s dancer around and comprises of a pink and black checkered dress with matching peaked hat. 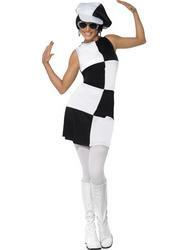 You'll be twisting the night away in style with this fantastic fancy dress costume perfect for any fancy dress party and massively popular for 60s themed events.